Windows Technical Preview is here. Despite Microsoft calling it a 'moving target' it can be used – at your own risk, see below – and many features do work well. So here's your guide to installing the Technical Preview by way of 10 things you simply must know about Windows 10's first available version – build 9841. You'll certainly see it evolve; Microsoft has promised regular updates. Don't install it if you don't know what an ISO file is or you don't have a separate PC to install it on. Microsoft is stressing that without knowledge, you won't get on very well. This is extreme pre-release software. It will have bugs in it. It will probably crash. It might change, things might not work. In short, don't depend on it! As well as that second PC, you need to do a few things in preparation. The main one is to back up your data if you're installing it on a PC you regularly use. If you are installing it on a PC you regularly use, you might like to think again. If you didn't use Windows 8.1 and might have issues with compatibility, check the Compatibility Center. Once you know that, you'll need to sign up for the Windows Insider Program, namely you need to agree to the terms and conditions that don't hold Microsoft responsible if you're silly enough to install it on a PC where you've got your unfinished dissertation and not backed it up. Your Windows 10 install will get regular updates. The ISO files for Windows 10 are around 4GB depending on which version you download – there are 32 and 64-bit versions of several different language versions – US English, UK English, Chinese Simplified and Portuguese. The Windows 10 key is NKJFK-GPHP7-G8C3J-P6JXR-HQRJR. 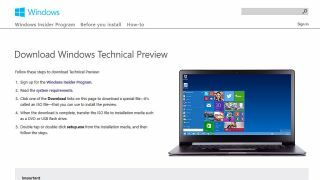 If it's an enterprise version you want, head here to download Windows 10 Technical Preview for Enterprise. Then you will need a DVD or USB drive large enough to hold a 4GB ISO file and to download one of the Windows 10 ISO files if you're installing it on a clean PC. We'd recommend a tool like Rufus or ImgBurn to copy the ISO to the drive. Your Windows 10 installation will stop working on April 15 2015. Windows 10 almost certainly won't be released then, but we may well see a beta of the OS to replace your Technical Preview install. Microosoft will remind users to upgrade after April 1 2015. If you're installing it from Windows 8.1 you can simply mount the ISO and execute setup.exe. If you're installing it from an older version, you can run setup.exe from the USB drive you created from the ISO. Double-tap or double-click setup.exe and then follow the steps indicated. When you go through the installation process you can choose to keep all your files or keep nothing, it really is up to you. If you're upgrading from Windows 8.1 or Windows 8 you can keep Windows settings, personal files, and most apps. From Windows 7 you can keep Windows settings, personal files, and most apps. But if you previously ran Windows Vista you must perform a clean install and can keep NOTHING. Sorry, but Microsoft doesn't like Vista anymore. Much like everybody else. If your PC can run Windows 8.1, you can also run Windows 10 Technical Preview. You need a 1GHz or faster processor with 1GB of memory for 32-bit or 2GB for 64-bit. You'll also need at least 16GB of free hard drive space. The preview won't work on Windows RT 8.1 and Windows N editions. Technical Preview works with touch, but "some things will be rough and unfinished" says Microsoft. The corporation is working on improvements for the OS to work with touch. If you're running Windows 8.1, Windows 8, or Windows 7 and have installed a language pack or a they'll be removed when you install Technical Preview. You'll see a message telling you to re-add them. You won't be able to use your recovery partition to downgrade from Windows 10 to Windows 8.1 or similar. If you have a recovery partition on your system, it will no longer be able to restore your computer to the version of Windows you had before. And, as you'd expect from a system with no recovery partition, you'll need to install a previous version of Windows from a DVD or USB drive when it comes to overwriting or wiping your Windows 10 install. You can use something like VirtualBox to install Windows 10 as a Virtual Machine. Simply click the New button in the main window to create a new machine, give it a name (you'll need to choose the Windows 8.1 option) and then when finished go to Storage in the left sidebar, and next to Controller: IDE, select the Add CD button, then Choose Disk and select the Windows 10 ISO. And there you have it – Windows 10 in a VM.